Methods at Hull House Explained by Miss Addams. SOCIAL SETTLEMENT'S SUCCESS IN A RIVER WARD. Meeting of Associated Charities Presided Over by Judge Hagner -- Election of Officers. Methods of reaching the needy classes of every community and uplifting them in an intelligent manner were the subjects for discussion at the regular annual meeting of the Associated Charities in the First Congregational Church last evening. 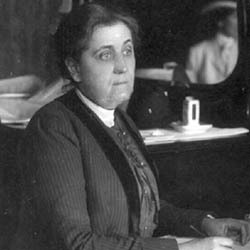 The feature of the evening was an address by Miss Jane Addams, who, with Miss [Ellen] Starr, founded in 1889 and has since conducted "Hull House," a social settlement in one of Chicago's crowded river wards. "Hull House" has been the subject of numerous newspaper and magazine articles, and Miss Addams has always been the hero of the little revolutionary movement, in which she enlisted her services thirteen years ago. 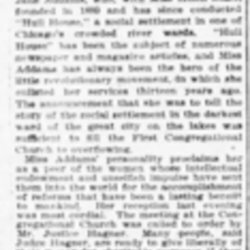 The announcement that she was to tell the story of the social settlement in the darkest ward of the great city on the lakes was sufficient to fill the First Congregational Church to overflowing. Miss Addams' personality proclaims her as a peer of the women whose intellectual endowment and unselfish impulse have sent them into the world for the accomplishment of reforms that have been a lasting benefit to mankind. Her reception last evening was most cordial. The meeting at the Congregational Church was called to order by Mr. Justice Hagner. Many people, said Judge Hagner, are ready to give liberally of their means for charitable purposes if they can be assured that the result of the giving will not be more harmful than beneficial. 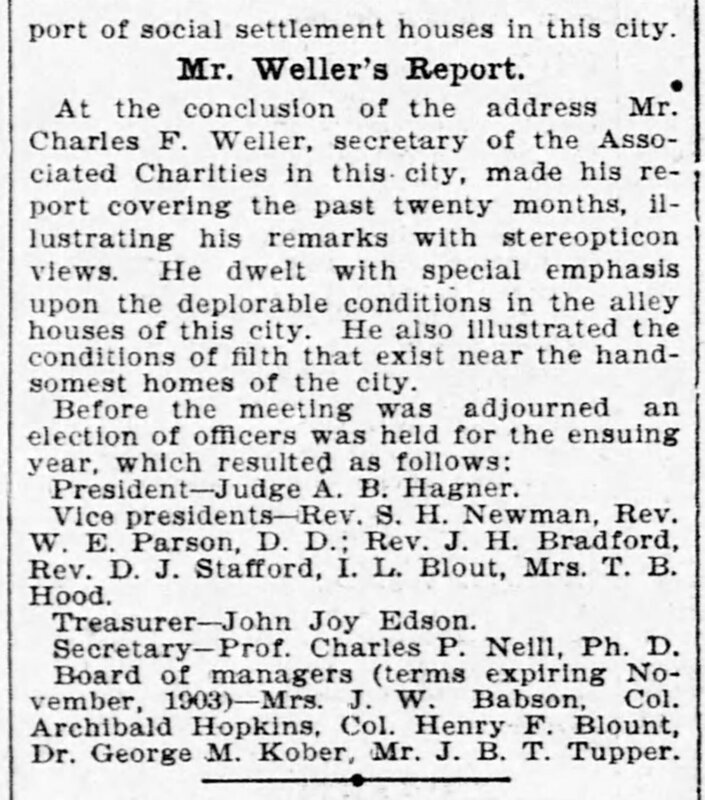 Everyone could be assured that such work as is being carried on at "Hull House" and elsewhere on the same plan cannot possibly have any ill effect. Mr. Hagner presented Commissioner Macfarland, who formally welcomed Miss Addams to the District of Columbia. "On behalf of the government of the District of Columbia I am happy to welcome Miss Addams," said Mr. Macfarland. "We honor her as one who has answered the old, yet the new question, 'Who is my neighbor?' in a Christ-like way. We can say to her 'Thou hast been a strength to the poor, a refuge for the distressed.' She has shown us all by her example how best to help those who need our help, instead of hurting them by our unwisdom. As a pioneer in the social settlement movement she has come to represent it in the minds of her countrymen. 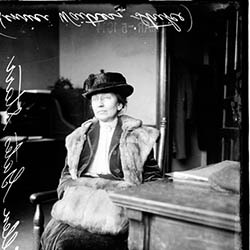 The gracious ministry of that movement, its self-denial, its sane and sincere charity, working by association, assistance and advice, rather than by alms; all this comes to our minds when we think of her living all those years in the fellowship of neighborhood life with the poor of Chicago, to their uplifting and advancement. Her career is an inspiration, not only to the scores of similar social settlements which are modeled on Hull House, but to every one of us." "Many people," she said, "who are not attracted by the ideas of charity in the [medieval] sense confuse modern methods with the old." Miss Addams spoke of the effort that is being made on both sides of the Atlantic to study the poor from a scientific standpoint and the good results that are being attained. "But they find," she said, "they cannot study the poor with only a scientific spirit. With intelligence there must be sympathy." If, she said, in studying the lives of our fellow-men it is found that people are badly fed, badly housed and clothed, then it is certain that a great source of power is lost to the community. "It loses first the work these people ought to perform," she said, "and it insures in the course of time that they will become a burden upon the community. It means that hospitals for their care, occasional aid and finally poor houses for their last days must be provided. Any city can provide means so that it is possible for these people to be brought back into the community as self-supporting members of society who are living lives consistent with good citizenship." She regarded it as more important to so rescue the people and place them on a plane of self-support than to care for them by charity. There should be a plane of living that no one should be allowed to go below, and the community should see to it that that is done. There was no excuse for diseases that come from sewer gas escaping into houses. Diseases that come from insanitary houses should be gotten rid of and the community should see to it that conditions are kept healthful in their own city outside of their own homes. A city in which children are broken down for want of food and work during their years of immaturity is a city that afterward has to bear the burden of their care. If conditions in that city have been such that the head of the family is removed prematurely by bad conditions of work and living, it will have widows and orphans to care for. Miss Addams thought the time would come when certain diseases would be considered disgraceful. "If it is womanly," she declared, "to nurse those who suffer from diphtheria and from diseases that spring from conditions of filth, then it is womanly to prevent conditions that cause these diseases." The method of work pursued in "Hull House" was told by the speaker in a most interesting way. During the last year the clubs were composed of over 600 members, and their interest was secured by various methods. It was found that the Greeks, the Armenians, Scandinavians and all the nationalities of Europe that come to Chicago have some forms of skill or special capacity for work that cannot fail to make them of interest when they are understood. Yet their skill is generally abandoned and frequently they are ashamed of their old world ways, or at least their children are. In order to develop interest in these people Miss Addams has organized dramatic clubs, in which the Greeks excelled, and the people who had only connected the Greek with a fruit wagon came to regard him as really an embodiment of the qualities of which they read in history. The Italian women and women of other nationalities would bring with them special skill in weaving or other handiwork which it was sought to preserve and demonstrate to others. A museum gotten up on this principle had become the greatest value in arousing interest among the people among whom the work is being carried on. Not only did others learn to value what could be done by these men and women of foreign countries, but the men and women themselves came to have a pride in their skill which otherwise some of them would actually seek to hide. Miss Addams thought the country would be the winner by a preservation of skill that so comes to its shores. The Work of Hull House. But the great work of "Hull House" consists in bringing the people together, in visiting their homes and of inspiring them with better ideas of living. Assistance is given only in cases of great need and sparingly. The result of the teaching had been to make that section of Chicago, formerly one of the darkest, now one of the cleanest. The people had not been "lectured at." An effort was made to appeal to their interest, so that what they did at "Hull House" was done in a way to make it appeal to the interest of the people, and they came there and learned ways of better living simply because their inclination led them to do it. 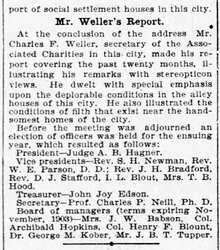 The principle on which "Hull House" was conducted was a thorough acquaintance with the community. Miss Addams urged upon her audience the support [page 3] of social settlement houses in the city. 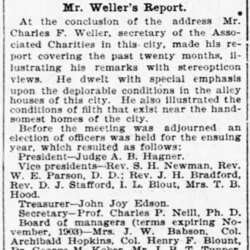 At the conclusion of the address Mr. Charles F. Weller, secretary of the Associated Charities in this city, made his report covering the past twenty months, illustrating his remarks with stereopticon views. He dwelt with special emphasis upon the deplorable conditions in the alley houses of this city. He also illustrated the conditions of filth that exist near the handsomest homes of the city. President -- Judge A. B. Hagner. Vice presidents -- Rev. S. H. Newman, Rev. 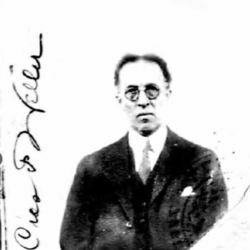 W. E. Parson, D.D. ; Rev. J. H. Bradford, Rev. D. J. Stafford, I. L. Blout, Mrs. T. B. Hood. Treasurer -- John Joy Edson. Secretary -- Prof. Charles P. Neill, Ph.D.
Board managers (terms expiring November, 1903) -- Mrs. J. W. Babson, Col. Archibald Hopkins, Col. Henry F. Blount, Dr. George M. Kober, Mr. J. B. T. Tupper. Associated Charities of Washington, D.C.
Addams discusses efforts made to reach the needy through settlement work. 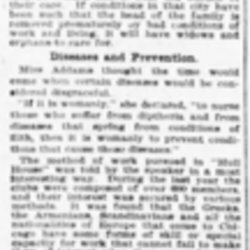 Reaching the Needy, Washington Evening Star, December 2, 1902, p. 13. The names of the officers of the Associated Charities of Washington, D.C. in the last section were not indexed. 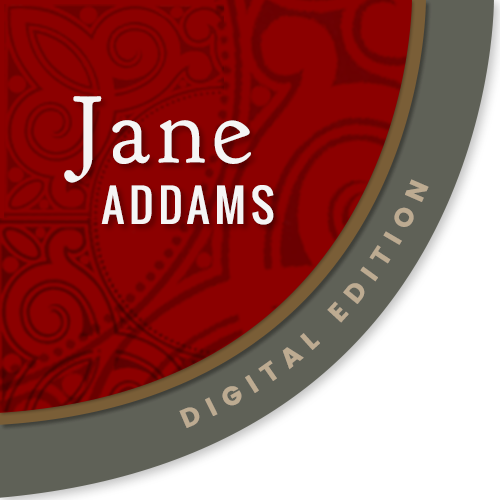 Addams, Jane and Hagner, Alexander Burton, “Address to the Annual Meeting of Associated Charities, December 1, 1902,” Jane Addams Digital Edition, accessed April 23, 2019, https://digital.janeaddams.ramapo.edu/items/show/16938.